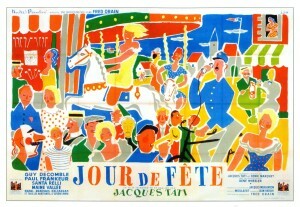 Jour de Fête (“The Big Day”) is a 1949 French comedy film directed by Jacques Tati. Jour de Fête tells the story of an inept and easily distracted French mailman who frequently interrupts his duties to converse with the local inhabitants, as well as inspect the traveling fair that has come to his small community. 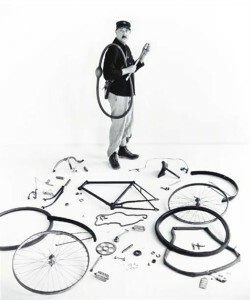 Influenced by too much wine and a newsreel account of rapid transportation methods used by the United States postal system, he goes to hilarious lengths to speed the delivery of mail while aboard his bicycle. 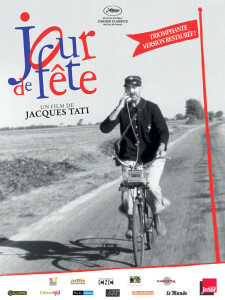 In Jour de Fête, several characteristics of Tati’s work appear for the first time in a full-length film. The film is largely a visual comedy, though dialogue is still used to tell part of the story, at one point using a background character as a narrator. Sound effects are a key element of the film, as Tati makes imaginative use of voices and other background noises to provide humorous effect. The film introduces what would be a key theme in Tati films, the over-reliance of Western society on technology to solve its (perceived) problems. The movie was originally filmed in both black-and-white and Thomson-color, an early and untried color film process. In using both formats, Tati feared that Thomson-color might not be practicable, a concern that proved well-founded after the Thomson firm went bankrupt before the film could be processed. Tati then released the black-and-white version (which features occasional short bursts of colour, hand-coloured by Tati directly onto the frames). In 1995, new technology allowed the restoration of the color copy, which was finished and released by Tati’s daughter Sophie Tatischeff and cinematographer François Ede. 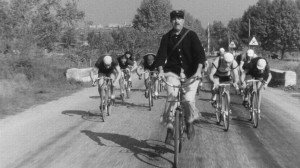 The film was shot largely in the town of Sainte-Sévère-sur-Indre and the surrounding region; many of the locals played the roles of extras.